INDIGO’s Human RAR-related Orphan Receptor Gamma (NR1F3; RORγ) Assay utilizes proprietary human cells engineered to provide high-level expression of a hybrid form of RORγ. The N-terminal DNA binding domains (DBD) of the native RORγ and RORγt receptors (isoforms 1 and 2, respectively) have been substituted with that of the yeast GAL4-DBD. Hence, the GAL4-RORγ hybrid expressed in these reporter cells will not discern functional differences that may exist between the native isoform 1 and isoform 2 receptors. Endogenous molecular activators maintain RORγ in a state of constitutive high-level activity. 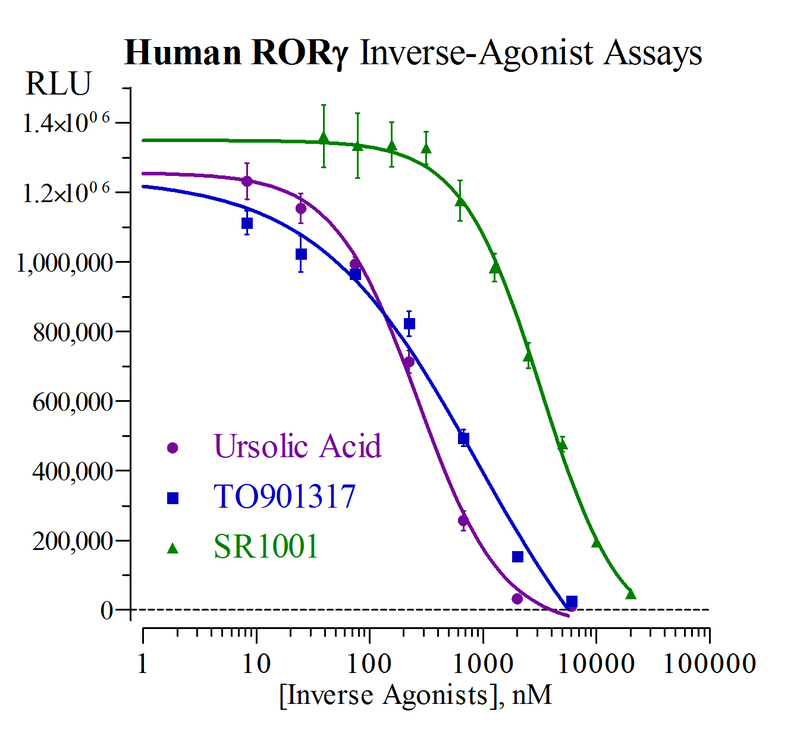 Therefore, the principle application of this reporter assay system is in the screening of test samples to quantify inverse-agonist or antagonist activities that they may exert against human RORγ. RAR-related orphan receptor gamma (ROR-gamma), also known as NR1F3 is a nuclear receptor encoded by the RORG gene.The RAR-related orphan receptors (RORs) are members of the nuclear receptor family of intracellular transcription factors. There are three forms of ROR, ROR-α, -β, and -γ and each is encoded by a separate gene (RORA, RORB, and RORC respectively). The RORs are somewhat unusual in that they appear to bind as monomers to hormone response elements as opposed to the majority of other nuclear receptors which bind as dimers. Melatonin has been reported to be the endogenous ligand for ROR-α while CGP 52608 has been identified as a ROR-α selective synthetic ligand. However X-ray crystallographic (PDB 1n83 and 1s0x) and functional data both suggest that cholesterol or a cholesterol derivative may be the endogenous ligand. In contrast, all-trans retinoic acid binds with high affinity to ROR-β and -γ but not ROR-α. RORγ Reporter Cells are prepared using INDIGO’s proprietary CryoMite™ process. This cryo-preservation method yields high cell viability post-thaw, and provides the convenience of immediately dispensing healthy, division-competent reporter cells into assay plates. There is no need for intermediate spin-and-wash steps, viability determinations, or cell titer adjustments. This kit product is an all-inclusive assay system that includes, in addition to RORγ Reporter Cells, two optimized media for use during cell culture and (optionally) in diluting the test samples, a reference inverse-agonist, Luciferase Detection Reagent, a cell culture-ready assay plate, and a detailed protocol.